We all get our creative inspiration from different sources. Many things inspire me to draw, design and stitch, how about you? Always I remember that one day I started to learn the technique of blackwork with Carol Leather ( with her sampler and her book), and then with Tanja Berlin. I am very grateful to these two magnificent teachers. Then there was a link to Maria's blog, and a photograph of quite the most beautiful piece of blackwork embroidery in progress. I just had to write to Maria and ask for permission to tell her story here! "I have been drawing and painting for many years and I especially love painting portraits. My other love is needlework and I always wanted to combine the two, but had found it difficult to know where to start. So I searched the internet for creative inspiration. First I found Tanya Berlin's website and was fascinated with her blackwork designs, a type of needlework I had never seen before. 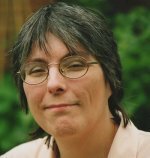 Then I spotted a link to Carol's site, about the technique, and followed it. Carol was at that time teaching a blackwork sampler, step by step in her newsletter so I decided to subscribe and stitch it along with her. I found the instructions easy to follow and really enjoyed stitching the sampler. 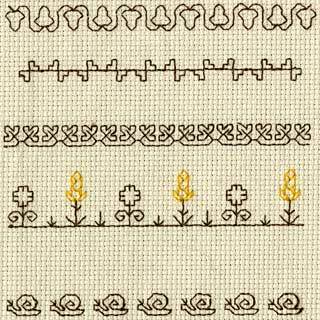 While browsing her site I noticed Carol's blackwork ebook where she mentioned "don't wait for 20 years to begin like I did!". My husband, Miguel, kindly bought the ebook, Blackwork for beginners, for me. What a beautiful gift! Full of creative inspiration it began to open my mind to shapes, shades and all the information it contains. 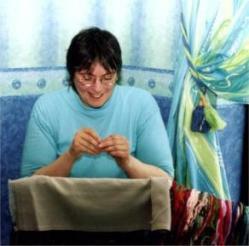 After some months I decided to start working on a needlework portrait in answer to a challenge by SharonB on her blog. There was a choice of a colour palette or an idea. I chose to work on the idea, which was "Who do you admire and why?" 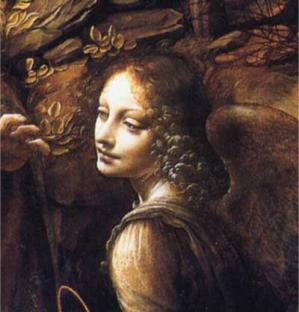 Our response had to include creative inspiration and as I love the works of Leonardo da Vinci and his painting Madonna of the Rocks I chose to make my own version of an angel from that picture. I picked some Lugana 25 count evenweave fabric and began to work on the design. After stitching for a while I realized I had made a mistake and I undid all but her face. In fact I spent a lot of time unpicking and restitching. 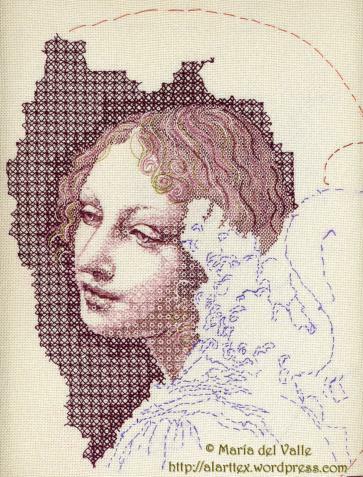 I spent much time searching for just the right blackwork patterns for the hair and the background, stitching samples of many until I found what looked good. I tried adding gold and silver threads for the curls in the hair. Then I experimented with different colours so that where they met it would be easy to differentiate between the hair and background." Thank you Maria. Don't you agree that this blackwork is just stunning? Maria has written about her progress on this piece on her blog and although it is in Spanish she has kindly included flags to click on so that it can be translated into a number of different languages. Take it from me it is well worth a visit! It will certainly fill you with creative inspiration.